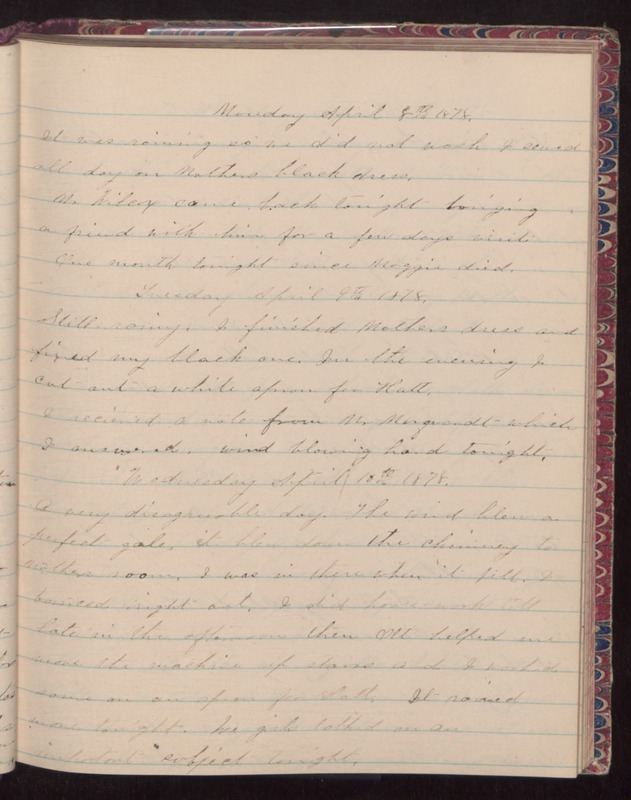 Monday April 8th 1878 It was raining so we did not wash I sewed all day om mother black dress Mr. Wiley came back tonight bringing a friend with him for a few days visit. One month tonight since Maggie died. Tuesday April 9th 1878 Still raining. I finished mothers dress and fixed my black one. For the evening I cut and a white apron for for Hall. I received a note from Mr. [Mongrandl?] which I answered, wind blowing hard tonight. Wednesday April 10th 1878 A very disagreeable day. The wind blew a frightful gale, it blew down the chimney to mothers room. I was in there when it fell. I hurried right out. I did house work till late in the afternoon then [all?] helped we [illegible] the machine up stairs and I worked some on our aprons for fall. It rained [some?] tonight. We girls bathed on are [illegible] tonight.